If you are looking for a great all round essential oil, then look no further than patchouli oil. Patchouli essential oils are produced from the handpicked leaves of the Pogostemon Cablin perennial herb that grows wild in Southeast Asia, Java, and Sumatra. It is part of the same family as lavender, sage, and mint. After harvesting, the leaves of the patchouli plant are left to ferment before using a steam distillation process to produce this distinctive and highly aromatic essential oil. Unlike most other essential oils, patchouli oil actually improves with age and it may change from a light golden color to a dark amber color as it ages. Patchouli oil contains a number of beneficial active ingredients including patchoulol, α-guaiene, and α-bulnesene, and it is these ingredients, along with various others, that provide some of the health and other benefits that patchouli oil has to offer. Although most ant species do not pose a large threat to us, an ant invasion can be annoying and inconvenient. Most insecticides on the other hand, often contain highly toxic substances that can threaten your health. Patchouli oil offers a natural way to help to keep those irritating ants at bay. Patchouli is not only great for ants but contains ingredients that kill off dust mites. Try mixing 8 oz of water in a spray bottle with 1/2 teaspoon natural soap, and 12 drops of the essential oil – remember to shake the bottle frequently to keep the oil mixed with the water and repeat every few days until the ants are completely gone. Another option is to place a few drops of essential oil on a cotton ball and wipe on baseboards and other entry points. To harness the natural insecticide benefits of patchouli oil in your own home, add a few drops of the essential oil to your linen, or place a few drops on your wrists to repel insects. You can also add a few drops of the essential oil to your washing water to help protect your sheets and other linen. Dust mites can accumulate in your vacuum cleaner, so add a few drops to your bag before you vacuum the carpets. Further reading: Find more information on how to repel ants, spiders, mosquitoes, flies and fleas. Patchouli oil has been used for centuries for the benefits it offers the skin. As an antiseptic, patchouli oil helps to fight infections in wounds and may help to prevent further infection. Patchouli is also a natural antioxidant that can fight the damage that free radicals cause to the skin. To take advantage of the antiseptic qualities of patchouli oil, you can mix a few drops of oil in a high quality carrier oil, such as sweet almond or jojoba, and then apply the oil to the affected area. Always be careful when using essential oils on the skin. It is best to create a test patch before using the oil to test for any potential reactions. Due to patchouli oil’s antioxidant effects, you can also add a few drops of oil to your face cream for a luxurious skin cream that can help to reduce wrinkles. Further reading: Read my article on how to make the ultimate anti wrinkle, anti aging treatment using essential oil blend. Patchouli oil can be used as an antibacterial to kill certain strains of bacteria including E. Coli, Staphylococcus aureus, and Pseudomonas. Many forms of acne include bacterial involvement. If you want to use patchouli to help relieve your acne, then mix a few drops of patchouli oil with a good carrier oil and dab the mixture onto the affected area. Further reading: Read my article about the best essential oils for acne. Certain conditions like athlete’s foot are caused by fungus. The ingredients in patchouli are not only antiseptic and antibacterial but may also help to kill off certain types of fungus like the fungus responsible for athlete’s foot. To apply patchouli essential oil to relieve athlete’s foot, mix 2 to 3 drops of the essential oil in a good carrier oil and apply to the affected area on your foot. You can also dab essential oil directly onto the area but be very careful when using concentrated essential oils directly on the skin. Further reading: Another great antifungal essential oil is tea tree which is also good to treat athlete’s foot. Find more information in my article top 5 medicinal uses for tea tree oil. Patchouli oil has been used by the cosmetic industry for decades and it has been used for health and beauty for centuries in countries like China and Japan. Patchouli oil is often used to help relieve conditions like dandruff and oily scalps. You can use patchouli as part of your hair care routine by adding a few drops of patchouli essential oil to unscented shampoo or conditioner or both. Use the shampoo or conditioner as you normally would. Further reading: Read my article on how to use essential oils for healthy hair. Pain and inflammation normally go hand in hand when it comes to injuries and wounds. The active ingredients in patchouli oil offer both analgesic and anti-inflammatory effects. Patchouli oil will also help to soothe those tired, aching muscles and leave you skin feeling smooth and revived. To take advantage of these benefits, add a few drops of patchouli to a good quality carrier oil and dab the mixture onto the wound to offer some pain relief. If you are suffering from tired, aching, and sore muscles, you can also add a few drops of patchouli oil to your bath to help soothe aching muscles and to help relax the body, or mix it with a carrier oil and massage the sore muscles. Further reading: Read my article about the top 16 essential oils to relieve pain and inflammation. The influenza virus is responsible for what we commonly refer to as flu. Certain compounds in patchouli offer antiviral properties and may therefore be beneficial in warding off the common cold. To promote immune function and to help to ward off colds and flu, add a few drops of patchouli oil to your bath or add a few drops to your aromatherapy burner. Another great way to relieve flu is inhaling the steam of boiling water with a few drops of patchouli oil. Drape a towel over your head and breathe in the steam. Further reading: Read my article about the best essential oils for cold and sore throat. Patchouli essential oil contains an ingredient called PA, or Patchouli Alcohol. Patchouli Alcohol promotes the natural cycle of cell (apoptosis) in colorectal cancer cells. Part of the problem with cancer is that tumor cells do not die when they should. The process of apoptosis is a process that programs cell death as a natural part of the cycle of life. In vitro study showed that patchouli may therefore be beneficial in promoting the process of apoptosis in certain types of cancer. Stress and depression often go hand in hand and prolonged periods of anxiety and stress can result in depression. Patchouli oil may help to alleviate depression. A hot relaxing bath is a great antidote for a stressful day and adding a few drops of patchouli oil to your bath can help to alleviate depression and to relieve the stress. You can also improve your mood through diffusing a few drops of the oil in an aroma lamp or diffuser. Further reading: Read my article about the best essential oils for anxiety and depression. 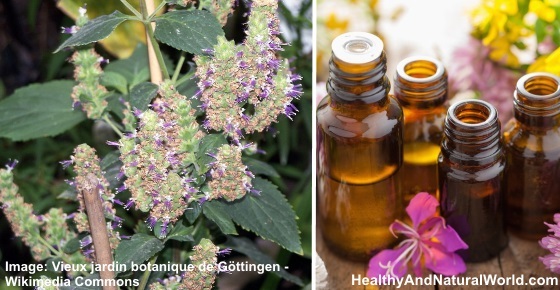 Where to buy patchouli oil and other oils from. You can buy essential oils at health food stores, herbal shops or online (like Amazon). Some pharmacies also sell the more common types of essential oils like lavender, tea tree.